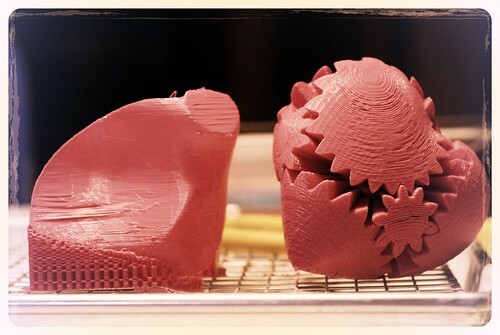 The print on the right is Emmett’s Screwless Heart Gears, downloaded from Thingiverse, one of our favorite sources of models and the best place on the Internet to share 3D models for printing. The print on the left is a right ventricle, scanned from a live human heart. A ventricle is an uncommon thing to print, not very romantic or novel on its face, but perhaps one of the most *interesting* uses of our printers to date. Perhaps one of the most important for our collective health as well. Ventripoint, one of Seattle’s awesome medical startups needed to test some of its technology, and they came to us for this print. Ventripoint, using technology from the University of Washington creates anatomically accurate reconstructions and corresponding measurements of the right and left ventricles of the heart using ultrasound and knowledge based reconstruction rather than MRI. By printing this model, submerging it in saltwater, and scanning it, they can test their hardware and software setup without using an actual organ. From what I gathered in our brief conversation, ultrasound is tricky, and by being able to quickly 3D print problem shapes, they can regression test their hardware and make sure that anomalies that get caught stay caught. The thin walled model in PLA holds up, is accurate enough to get a detailed reading, and would be hard to create in any other way. Testing for pulmonary hypertension in the conventional way using MRI is an expensive procedure and limited to those that have the equipment. By using a combination of Ventripoint software and a traditional ultrasound, this procedure can be brought down considerably, and made accessible to many more people. Its nice to know that we can be a small part of this.